I teach the therapeutic benefits that stem from proper alignment, intentional breathing and acceptance. Asana practice requires patience so that correct technique and alignment is developed before range of motion. It is important to me that students are safe and able to sustain their practice in a nurturing and fulfilling manner throughout their lives. To that end I emphasize developing and maintaining core integrity and muscular strength in each posture. This allows the student to safely develop range of motion without overstretching or collapsing into their joints and ligaments. Breathing is a bridge between the mind and the body; Intentional breathing promotes awareness and control over both. This mindfulness is a form of moving meditation that enhances the student’s awareness of themselves physically, mentally and emotionally. This is enhanced with the use of a mirror so that we are forced to recognize ourselves as we are. Ultimately this leads to a choice: accept or deny. Those that deny, give up. Those that accept begin the healing and transformational journey of a yoga practice. As we learn to accept ourselves as we are we open ourselves to compassion, to love, to understanding and forgiveness. This is a huge stress relief. Stress is a precursor of many illnesses. Personally, I have suffered from anxiety issues most of my life and I know the damage that stress can do. I experienced severe post partum onset anxiety and depression after my first baby. I struggled for 4 years to overcome this and once again, my Yoga became my anchor. The hot room somehow allows me to crack open my shell of anxiety and become a conduit for transformation both in my practice as well as my teaching. I see reflected in my students the physical, emotional, or mental pain that I and so many others have gone through, and I respond from a place of empathy. I know how powerfully this Yoga can change lives; I have witnessed it for 16 years. It is the greatest gift that I can give to my community. Reciprocally, to share the healing power of yoga and to see the joy and transformation of my students is the greatest gift I can receive. I graduated Bikram’s Teacher Training in November 2002. I have taught at Maine Hatha Yoga since then. My teaching style evolves over the years. Recently I am emphasizing the benefits of conscious breathing. I use many metaphors that dance around the relationship between Ha, the Sun energies, and Tha, the Moon energies. I find that the dance of Ha and Tha is the dance of life. This original duality has many mirrors that can be used to gain insight into the wholeness of ourselves and our context within life. 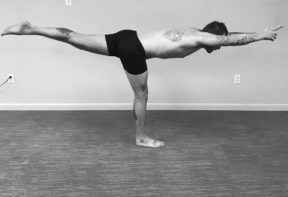 The dynamics of structure (Tha) and energy (Ha) are particularly relevant to the Hatha practice. Understanding and bearing witness to these personal and dynamic relationships within and throughout ourselves is a path that unleashes the potential of our practice. I teach with the intention to facilitate understanding rather than stressing exertion or effort. The first time I took a Bikram-method hot yoga class was in 2003, and shortly afterwards I knew that it was going to be part of my life from that moment forward. Less than a year later in January 2004, I attended the teacher training in Los Angeles and have been teaching this method of yoga ever since. While teaching Bikram I also became very interested in the positive effects of Yin yoga, and have also now been a Yin instructor for the past couple of years. I have taught the Bikram method both in the USA — Maine, New Hampshire, Massachusetts and California — and also in Great Britain. I have never had a typical yoga physique — whatever that really is anyway! My knees are not great; my hips and hamstrings will always be somewhat tight. This has taught me perhaps the most fundamental lesson about yoga — ACCEPTANCE. It’s NOT about forcing yourself to bend in impossible ways and then becoming frustrated, or worse injuring yourself. Rather, its about finding the level and depth of a posture that works for your body at any given moment in time, which varies from day-to-day and year-to-year. Challenge yourself but don’t force yourself is one of my primary mantras. 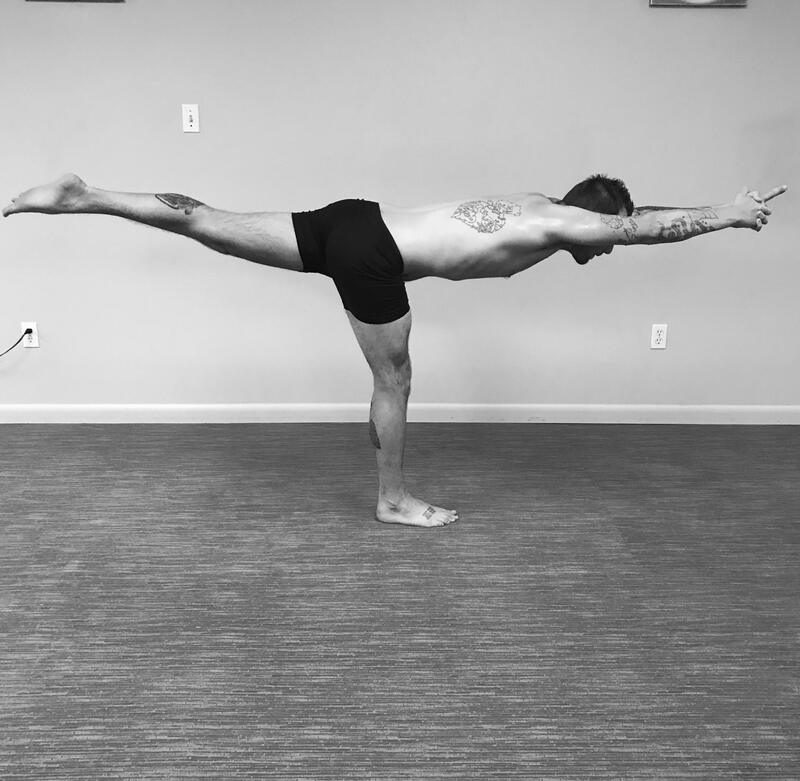 The Bikram method has always provided me with just the right ingredients — in terms of the postures, their sequencing, and the balance between active work (yang) and more passive work (yin). Our lives need both active and passive in order for us to remain both physically and mentally healthy, but often we are only taught to focus on the active. By allowing time for the passive as well, we become happier, more productive, more creative and more in touch with the beauty that surrounds us. And for the times when we need more yin energy, then there is Yin yoga as well. I started practicing Bikram Yoga in January 2011. I had no idea when I stepped into that room in baggy sweatpants and a t-shirt that my life would be forever changed. The years before that I was on a self-destructive path- my life was controlled by fear and uncertainty. I had no self love and was close to being hopeless. For me, the most important quality this practice has blessed me with is self-love and compassion, because without that how could I truly have compassion and love for others. I have let so much go in the hot room; past traumas, years of substance abuse and medications, judgments of self and others. The list goes on and on. I encourage students to always look in the mirror, not only at the structure and alignment of body in asana, but to look deep into their eyes and see the fire within. The light, the strength, and the energy each soul brings into that room is amazingly powerful. We all go in for the same reason; to be better – to improve the quality of our lives. Whether it be spiritually, physically, or mentally, if you go in for one reason the other two will follow and show you the way to something so beautiful you never knew possible. So blessed to have this opportunity. I went to my first Bikram Yoga class on a snowy night in January 2006. I wouldn’t say I loved it from the first class, or even the second, but I’m a person who doesn’t shy away from a good challenge and I found it absolutely thrilling. You see, I had not been taking very good care of myself and I suffered. After I began practicing regularly that all changed. I wanted to take responsibility for my well being by eating better and drinking more water. By Spring, I realized it was the first winter in many I wasn’t depressed. I had lost weight and gained clarity on the direction of my life. My first of many breakthrough moments came during a particularly intense class a couple months later when I finally looked into my own eyes in the mirror and saw someone who was trying their best. Someone who was strong and deserving of love. I chose to love myself in that moment and every moment after. I am honored to be able to share that love as a teacher with a focus on compassion and self acceptance. I attended Bikram Teacher Training in Spring 2007. I enjoy teaching both new and advanced students. I find fresh perspective in each class I take and I am open to the possibilities of growth in each new day. As a teacher, my inspiration comes from the students and a desire to help others. At the end of the day, I’m sure attending class has made a difference in their lives and all the lives they touch. I lead class with a strong focus on the details of alignment and breath, as well as how we carry ourselves through the process. With attention to these aspects, the benefits of yoga are amplified. I first found yoga at my gym in 2004, after one class I was hooked. At first I was excited about the movement, and the aesthetic benefit my body received. Within a few months I realized many deeper meanings my yoga practice offered. It is my exercise, my therapy, and a major support in all aspects of my life. I began teaching in 2007, and, honestly, I benefit as much from leading class as I do in my own practice. I have a background in dance, as well as art. These elements are a strong influence in my style of leading class. I strive to give support, guidance, and clear instruction to each person that has the courage to take on this challenging work. Yoga has been the single most healing agent in my life. For years, I struggled with physical and emotional pain. Like so many, I was subjected to years of trauma as a child which left me physically and mentally broken. Tired of feeling less, and not enough, I tried my first Hot Hatha Yoga class. I was kind of gobsmacked when I was done, but knew big change was going to happen for me if I continued this practice. I did continue and I let the heat melt away layers and layers of pain, low self esteem and anger. The pain left and my heart opened and healed. It didn’t always look pretty but it worked. One of my favorite sayings is “ Salt water is good for the soul, be it the ocean, sweat or tears.” I couldn’t agree more. This practice is healing physically, mentally and it is just a great workout. In my class I focus on breath, conscious movement through breath and conscious releasing through breath. Prana in sanskrit means Life Force or Vital Principle. We activate Prana through intentional breathing. To become intimate with our Life Force energy we need to become one with our movement within conscious breathing. Once we become aware of our breath in movement we become aware of who we really are. The advanced yogi is not one who can do the challenging posture. It is the yogi who shows up, has full awareness of self on and off the mat and moves towards peace and stillness, even when the world is throwing storms. 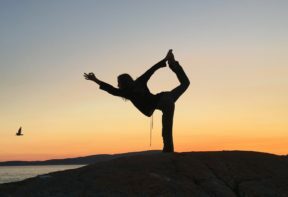 My journey in this practice began one chilly winter evening at our beloved studio here in Portland, Maine back in 2009. I went in with one of my sisters (I think she was even the one who picked out the studio!) and told me that we were going to a yoga class that would be heated. I was in, I wanted a place to warm my bones. I had no idea what to expect when I walked in or what would transpire in the months and years to come. The first class, I remember I laid down most of the practice, out of breath, sweating out of every pore. When I returned home that evening, something inside urged me to get back into the studio, and so, I continued to practice often in those first 30 days. The studio evolved into a place that felt safe to me, my sanctuary. I began to notice even in the first 30 days, that some of the postures became less difficult the more I went in and the heat wasn’t as jarring. I had just gone through a pretty major health transformation not too long before I entered the studio. I had lost 60 pounds through learning about nutrition, changing my eating habits and starting to run. What I began to realize, however, was that I still lacked the confidence in both my perceived abilities, as well as, my sense of beauty and love for myself. I don’t think I looked at my own image directly in the mirror for the first 6 months at least. As time went on though, I began to take a peek here and there, which introduced the idea to become invested in my alignment. Now, as my practice continues to develop, I feel more beautiful standing in that studio, with no make-up on, hair all over the place, and all the sweat falling off of me than I do anywhere else in the world. This studio holds a very special place in my heart and I am incredibly honored and overjoyed to be a part of sharing this practice, one that has served such a valuable purpose in my life, with my friends, family, and community in Portland. I hope to ignite the senses outwardly and inspire awareness inwardly within my students. I was 19 when I went to my first Bikram method class in 2007 in Burlington, Vermont. I had zero connection between my mind and body other than a lifetime of extreme self-deprecation and judgement. I always fixated on how my body didn’t look the way I had wanted it to look, and chased many unhealthy fads and habits that left me worse off. The foundation that the asanas created allowed for my practice to continue to change and grow over time. Sometimes a physical or emotional setback manifests, and as frustrating as that may be it is imperative to reconnect to my practice and work through whatever barriers present themselves. Every day is different than the day before, and there is usually no knowing what to expect. My practice and understanding of Yoga is constantly changing and evolving, and I thank myself for listening to what my body is telling me in any given moment. This practice has helped me be the expert of my own self through connecting my mind to my body, and my heart to my breath. I wish to be a support system for anyone who wishes to conquer their inner-saboteur and work towards a more whole version of self. I am very aware of physical alignment in my practice, and work to translate that attention into teaching. 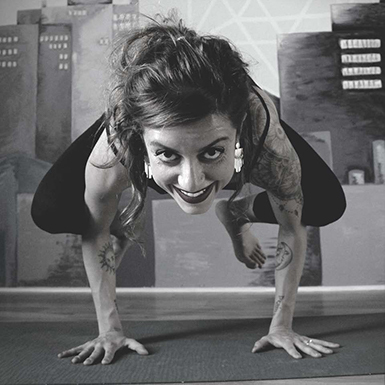 Jennie is a quirky, loving, former long distance runner, artist, activist, feminist, healer, business owner and mainer with a fierce dedication to the principles and practice of yoga and meditation. The first time she ever practiced yoga was over 15 years ago. 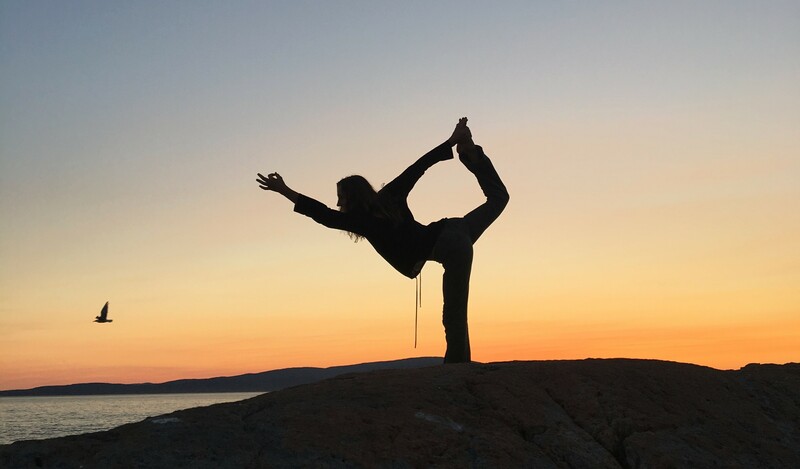 Jennie utilizes yoga as means to ground in the present and soothe her fiery soul, but beyond the physical practice, she is learning to embody yoga’s philosophies and values and move closer to her ultimate goal- to live yoga. Part of Jennie’s path to yoga includes her own struggles and triumphs over addiction and PTSD, and thus she believes deeply in it’s transformative potential. Jennie uses Ayurvedic and yogic tools such as posture, mindful adjustment, breath work and meditation to create targeted classes and sessions that address individual and group needs- physical, energetic, and psychosomatic. She aims to empower her students to participate in their own healing process by teaching practical tools that can be used on and off the mat. In 2011, Jennie began teaching yoga and has since acquired over 2,000 hours of teaching experience. 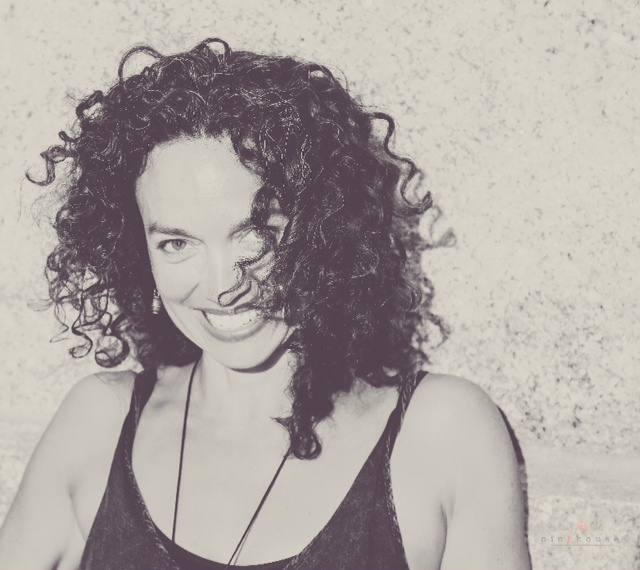 She has over 400 hours of training in yin yoga, vinyasa yoga, kripalu yoga, chakra- based yoga sequencing, yoga nidra, dynamic anatomy, barre, HIIT, pilates, meditation, reiki, yoga for addiction recovery, trauma informed yoga and yoga for healthy body image. She also graduated from USM with a Bachelors in Psychology and Holistic Health. 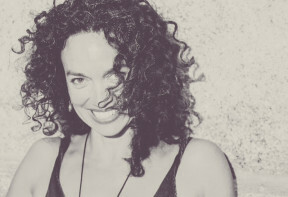 We invite you to join Jennie in a spiritual and somatic journey of comfortable embodiment, radical self acceptance, and surrender. After many years of sitting meditation, Kelly was drawn to yoga in her 20’s as a form of moving meditation. Falling in love with the lucidity she felt on the mat, she enrolled at the Nataraja School of Yoga and recieved her 200 hour certification in 2011. Training in Iyengar gave her an appreciation for precise language and taught her the import of an alignment specific practice. She combines those principles with vinyasa and hatha styles and a healthy dose of pranayama. She brings to class her love of and anatomy and her deep fascination with the subtle, mystical and energetic aspects of the human experience. Kelly is certified in advanced polarity and craniosacral therapies, a conscious channel, holistic nutritionist, reiki master teacher and licensed massage therapist. She has been practicing professionally since 2001 and has true passion for helping her students and clients find their access point into the higher infinite nature. Kelly is an avid runner, beekeeper and backyard herbalist. When she is not in her office or the studio, you can find her out on Portland’s beautiful trails or tending her hives and perennial flower beds. Every year she escapes the long Maine winters when to paddle board in the warm Hawaii waters and enjoy a practice with sand in her toes.